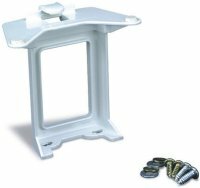 Universal Mini Table (#0167) attaches for convenient support when grinding with a 1/4" or 1/8" heads. The tables water well and sponge system provide enough coolant for approximately 30 minutes of grinding. 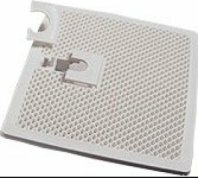 Glass Eye Shield Support (#0163 -- pictured at left) will fit any grinder with an open grid. 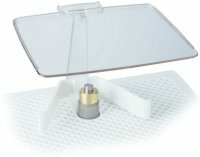 This support will hold a regular piece of window glass (not included) which can be cut to the size that the user desires and window glass is much more scratch resistant than plastic. Plastic Eyeshield (#0178 -- pictured at right) will fit all Glastar grinders, except the G8 and G9. This hard polycarbonate lens will protect your face and eyes from glass chips. Straight Edge Guide (#0164) works with any grinder with an open grid. Fix the guide into place on the grid a set distance from the grinding head and you can ensure yourself straight and evenly ground strips. REPLACEMENT TOP FOR G-12 AND G-14 (#0172) Fits the SuperStar II and DiamondStar Grinders. LARGE REPLACEMENT SURFACE FOR G-8 (#0169) This is the "main" surface for the AllStar Grinder. Order small surface at right. SMALL REPLACEMENT SURFACE FOR G-8 (#0168) replaces the small elevated work surface on the G-8 model ONLY.